2019 started very interestingly with as far as Engines are concerned, from the GE-90 and CFM56-7B of Boeings to the Airbus Rolls-Royce Trent 700. 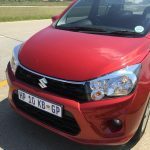 Suzuki South Africa were courteous enough to land me the 1.0L 3 cylinder K10B engine that has power output of 50kw at 6000rpm and a torque adequate enough to shuffle one around town at 90Nm all attained at 3500rpm. Massive change in engine difference were notable, but then again one cannot equate Plane to Car. 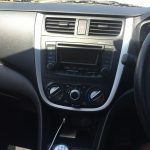 It is very well specced little car with Bluetooth Connectivity, USB port, Remote Central locking system, and most importantly safety systems ranging from ABS and EBD. The DAB radio is standard of course. The seats are covered delicately in cloth, just be careful if you have a young one not to spill greasy liquids on them as stains cannot be good sighting to some of us. Another notable with the seats are that they very basic, almost like bench seats albeit with the cloth covering. The legroom and headroom for both the rear and front is adequate enough for all adults on-board. I stand 1.8m tall and I was seated well in the middle position. The elongated shape and its high centre of gravity plays a role in the spaciousness of its occupants. The boot size is ideal for a new comer or even a student to fit in school bags or computers. It will be a challenge to fit your weekend getaway artillery as it won’t be forgiving to accommodate decent luggage. 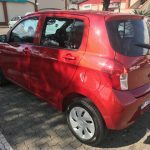 Its height is what catches one from a “small vehicle”, it has a deceptive ground clearance that is almost cannot be mistaken from the rivals in its segment. Comes standard with fog lamps that are located on the tropizonal area lower down the bumper on each side. Glaring main Beam lights nicely tucked on the blacked-out grille. The tyres sizes for both front and rear are similarly at 165/70/R14 with a magnificent turning circle at 4.7 m. You will ideally expect the car of this size being a city slicker to turn without any hassles, and does it well. Where do I start here? When I first received the car it was honestly no joy for me at first drive. I approached it like how a first timer or low budget driver would, and wasn’t impressed. The car felt a bit jittery from the steering (too playful) and the gearbox that seem to generate an amount of a “clunk” sound at low rpm. This was solely on city driving. But since this was a Suzuki, my mind just had to click to a different setting where I decided that I will REALLY have to make the Celerio to impress me. 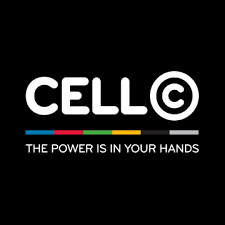 If you imagine how taxi drivers in the morning from Bree Street in Johannesburg drive up North of the City Gold when they lash those Toyota Hiluxes, that’s exactly how I made the Celerio to reward my driving. The 1.0 N/A engine together with that 5 speed MT started to be in sync and was changing my gear at every 4000rpm from either gear going up, and was gathering speed effortlessly and comfortably. The Blazing Red color was a draw card in town as you could see the eyes on it were endless (maybe probably along “what Suzuki is this”). 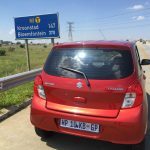 It was the turn of the freeway drive where I took it to some spirited N1 lurch, and crosswinds wasn’t something it took lightly off. The playful steering wheel I had to keep it under check and most notably keep my speed at a comfortable 115kph. Any speed beyond that was inviting TURBULENCE out of nowhere. 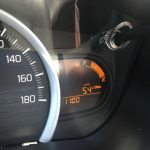 My return fuel economy was 5.4L/100km which is actually brilliant considering the extent of how expensive fuel is in the country. 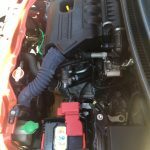 Manufacturer claim fuel take is 4.7L/100km which can attainable under different circumstances. 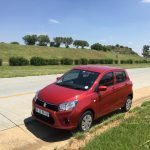 There are a lot of players in this segment(Kia Picanto, Hyundai i10) and honestly feel that the Suzuki Celerio will have its hands full amongst these. 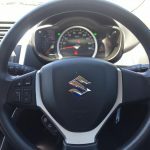 From what Suzuki SA offers in terms of after service: 2 years/ 30000km Service Plan and 3 year/100000km Warranty , could be one of its selling points.